In this article I'm going to write about what happens when a student takes a break from taking guitar lessons. Every guitar teacher has students who are not as "serious" about the guitar as he used to be (or would like them to be), so from guitar teacher's perspective, this article is merely a proof, that his students are no different from other's. This article is more intended to tell the students, why it's not a good idea to take a break. Why do students take breaks from guitar lessons? First of all, students take a break from getting lessons for many different reasons. There might be exams in school, summer break, holidays etc. If students experience guitar lessons more as burden than something fun and useful, they will take a break from them on every possible occasion, with every possible excuse. So, the first step to prevent students from taking a break must be made by the guitar teacher, who needs to provide exciting lessons and knows how to motivate the students. This of course isn't the easiest thing to do and it takes a competent guitar teacher with good motivational skills to accomplish that. How to that is a topic for another article, in this one I will concentrate more on why it's not a good idea to take a break from students' perspective. What happens when if your child stops taking lessons for a certain period of time? If he or she is not very self motivated and has no strong goals and determination, they will also take a break from an instrument altogether. In their mind, they has reached a certain level and can improve from that point on, whenever they decides to start taking lessons again. Of course, this couldn't be farther from the truth. When a student takes a break from practicing an instrument, his ability to play it starts declining immediately. After a week of absence his or her playing becomes sloppy even while playing things they could play easily before. After a longer period of time, a student's ability drops so much, that they has to re-take many of the same lessons again. So if a student is at level 10 and takes a break, after two months of absence they might drop back to level 3. To get back on a level 10, they would have to re-take all the steps they had to make to get to level 10 in the first place. This is, of course, very frustrating and a dangerous motivation killer, but also time consuming and last but not least, expensive. Why pay twice for the same thing? Stupid, huh? Getting back to the same level might be a little bit quicker than it was the first time, but still not worthwhile at all. So, what to do, when there's no other way, but to take a break from lessons? There are a few ways to prevent a student from losing the abilities they has worked so hard to get. · First one it the least favourable, and it's a good idea only if a student can't come the lessons at all (leaving the town for a longer period of time, longer sick leave, etc.). In this case, a student has to make a practicing plan with their guitar teacher, merely for the purpose of staying in shape. This will work only if the student is self motivated and has developed a good practice routine, otherwise it will fail. · Second option is far more favorable. The student has to sit down with the teacher and find the optimal balance between the number of lessons weekly and their other activities, that are preventing him from visiting the hours full time. In this case, the focus will not be on improvement, but on maintaining the skills of a student on the same level, until the student can return to visiting hours full time. So if a student has been taking 3 hours weekly during the year, he might take 1 hour during the summer break. This way, after the summer break they will be able to continue from the same level he was on before it. This will save him a lot of time and money in the fall, but even more important, it will prevent him from getting frustrated and quitting. · The third option is of course the best and most obvious. To continue taking the lessons the same way as during the year. Of course, this doesn't mean they can't go on vacation or anything like that. If they goes, they can compensate for the missed hours after that. In this case the progress will take only a short break or not stop at all. Students often don't see what us guitar teachers do. We can compare the students who took a break with those who didn't very easily, and see what a huge gap appears between the two. Sometimes it's quite scary to be honest. So if your child is thinking about taking a break, sit down with your guitar teacher and find the best possible solution. In general, every solution is better than to take a break completely for a couple of months. This article was written by Nejc Vidmar, a professional guitar teacher with more than a decade of teaching experience. He's also accomplished musician, composer, producer and writer. What are Chinese Parents doing Different to Western Parents when it comes to their children learning a musical instrument? 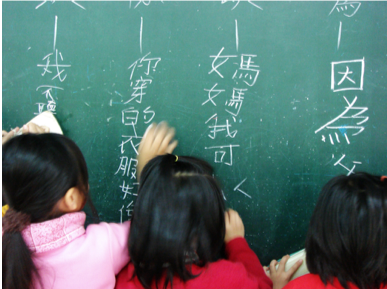 There is a lot of stereotypes when it comes to Chinese kids compared to western kids. Chinese kids appear to have a natural talent for mastering music and maths to become little protégés. But what is really going on to make them so different? What is happening with their parenting for their children to have these abilities so consistently? I am writing this partially from a first-hand point of view. I have met many western parents here in the UK while having grown up in Hong Kong. Seeing first-hand accounts of children who have had strict Chinese upbringing. There is a clear cultural difference between the two, and this is what I've learned from them both. Of course, many other cultures fall into the stereotype "Chinese" parenting. In Hong Kong, competition is high, and education is placed at the utmost importance because of it. If a child does not have a grade 3 or above in a musical instrument, they cannot enter a "decent" high school. This puts more pressure on parents to ensure their child pass their musical grades and exams. When I speak to western parents, for most of them, the most important thing is for their child to have fun learning. Their child's happiness and self-esteem is the centre of every decision when it comes to music. Many western parents would agree that music has many benefits to a child's development. They will not pressure their child to do music if it's something they don't enjoy. Chinese parents appear to be able to forego a child's happiness for the sake of progress and grades. They believe system is that a child will enjoy the instrument once they get good at it. Chinese parents will make sure their child practises late into the night to perfect a piece if necessary. While a child does not have the ability to be disciplined enough to practise by themselves. It is the parent's role to push their child to be the best version of themselves. Western parents are a lot more laid back. They do not want to hassle a child to practice. Forcing a child to practice can have two effects. Either they end up overcoming their challenges. Realising how much they enjoy playing now that they are better. Or they rebel, throw tantrums and want to stop altogether. Getting the balance relies on how compliant your child is. How much they have for you as a parent. And how much they want to play the instrument. If you can find a way to spark up their interest, so there is a small fire inside that you can harness. That is the best scenario for them. It is also important that the child knows what to practise, and how. So when they do it, they know that they are improving, so they don't get frustrated. If you want more tips on how to encourage your child to play the guitar, then have a read of our other articles. As a parent. It is important to understand that learning any musical instrument, guitar included. Is a craft that with perfect practice. Any child can be brilliant at it. It's much more common in Western society to place "talent" as the reason why their child can or can't do something well. This is one thing that we can learn a lot from Chinese culture. They believe it is hard work and effort that will get you results. As I said before, perfect practice along with enough hours and determination. Means that any child can master a musical instrument. So instead of thinking your child isn't "talented" when they can't play something. It may be worth considering, how can I encourage them to work a little harder to overcome this challenge? There is one big difference between western children and chinese children who play their instrument long term. And that's creativity. The reason is that creativity is not valued in the Chinese culture. They want perfection in grades, not improvisation. While creativity is something that is trainable. (We do it here every day with kids and adults on the guitar.) It's not something that Chinese kids work on. They focus is on perfecting exam pieces. Which is why many of them, when they grow up to adulthood. Give up their musical instrument. They struggle to be creative and don’t feel like a musician. Creativity combined with hard work is what produces what appears to be "talent". And for children who work hard on their music in the UK, with supportive parents. They are able to become brilliant at their instruments and feel good about their playing. Often wanting to go on to become musicians. This is why the UK, for such a small country, make up 17.6% of the world's global music industry in record sales. The teaching and the culture of western parenting create a different kind of protege. This also has a significant lasting effect. There are many merits in both western and Chinese parenting. While it is impressive what these Chinese children can do. A balance of creativity and hard work ethics is key to a child's result on a musical instrument. While you may look at Chinese children and believe it is innate talent that allows them to be little musical geniuses. Know that it's the strict parenting behind it that creates this illusion. Remember that being able to perfect exam pieces at a young age is not a determinant of the child achievement for music in their lifetime. Nurture and encourage any love your child has for music. Be firm enough so that your child knows that perfect practice is important for their success. Get a great teacher who will teach them how to be creative and have fun on their instrument, and give them lots of opportunities to be inspired. All these components to help towards your child's success on a musical instrument. If you would like a school that focuses on both your child having fun, and teaching them to work ethics at the same time. On top of that, have a focus on creativity. While giving them opportunities to perform to boost their confidence and self-esteem. Then you've come to the right place. Then click on the button below to sign up for a free introductory lesson to find out how we can help your child. The Introductory Guitar Lesson will help us workout we are a good fit with your child, and make sure they get on with our guitar teacher too. Many children around the UK have the choice to take part in either free or subsidised music lessons at school. There are also many private institutions that offer music lessons as well. But why pay for something that you can get for free or subsidised? I thought an article about this topic would benefit parents who value their children's education, their own time and their children's time and their future. Musical education is so much more than just the guitar lessons themselves. Based on my own experience as children. And also from the parents and children who have experienced both free or subsidised guitar lessons and our private lessons. We've seen a lot of frustrations that the parents and kids have experienced. Furthermore, it pains us to see children who have come from school lessons that have lost the love of guitar due to bad experiences. Before signing your children up for free lessons at school. If you can afford private guitar lessons, it may be worth investigating what is available near you and what the benefits are compared to the lessons provided in school. Firstly, music highly benefits our children, from helping them to become more coordinated through increased brain connections. To improving cognition. All of which are benefits that will last the child’s lifetime. These neurological benefits are only a small part of the advantages. There are many other benefits that learning guitar can bring to the child. Read our article on Benefits of Guitar Lessons for Kids to find out more. To get and maintain these benefits, the child has to spend a sufficient amount of time playing and making progress. The easiest way for them to do this is to have fun in lessons and enjoy the learning experience. Lessons provided at a child’s local school tend to be around 10-20 minutes long. 10-20 minutes is a very minimal amount of time to spend in lessons to get any benefit out of it. If you imagine a child, having rushed from one lesson to another, rushes to their guitar lesson. Spends the first few minutes setting up their guitar and the last few minute packing up their guitar. And also chatting in between the lesson. They are left with 5-15 minutes of the lesson! Then on top of the that, the teacher has to explain the material. Then your child gets to play the guitar for a few moments to 10 minutes at the most. If I asked you if you remember what you had for lunch a week ago and what conversation you had at that time...Imagine how hard it would be to remember! Now imagine having to practice what a teacher has said in those few moments and do it correctly when at home to make progress. It's challenging for a child to do when they spend more time with many other subjects of learning. Unless they are pushed or extremely enthusiastic and takes a lot of their own initiative, they struggle to find headspace to keep that information in. On top of this, learning a musical instrument requires precise tactile instructions. Which means that feedback is necessary to ensure they are playing correctly; this precision is vital to their progress. I’m not suggesting that your child needs to have 100 hours of lessons and practise eight hours a day. However, I have seen schools that don’t even let their child take their instrument home. How do they expect them to learn an instrument playing 10 minutes a week? What does Mozart have to do with your child? Consider Mozart, who everyone said was a child genius. He had practised 3000 hours by the time he was five years old. If your child did 15 minutes of playing a week (which doesn't count as practice.) It would take them 12,000 weeks to achieve 3000 hours. That’s 230 years of learning. For parents wondering why their child isn’t “talented”. The lack of time practising is a huge contributing factor. On top of this, Mozart's father supervised his every hour of practice to make sure everything Mozart did was perfect. On top of this. You don't know who the guitar teachers are. They are often outsourced, and there is no specific qualification that you have to have to teach guitar. You can have great guitar players who are not good teachers. They forget what it's like to be a beginner and struggle to teach methodically to help children progress. There are also guitar teachers who are self-taught teaching bad habits to children. There is no choice what teachers your child gets, and a child shouldn't be expected to know if their teacher is good or not. The teachers can also disappear. Programs shut down unexpectedly. Or lessons have limited availability. Children end up upset and confused because the whole teaching is inconsistent. They lose trust in their learning and fail to consistent learn what's needed to help them progress on guitar. When children are learning in these free or subsidised lessons, they are often forced to be with other students who are not motivated. They become a distraction to their learning, which further reduces the value of the lessons. As a result, your child can get demotivated, thinking that it’s their fault they are not doing well. Or get frustrated at learning or finding the whole experience annoying. We meet a lot of students who come here after having had years of ineffective teaching and numerous bad experiences with different music teachers. Fortunately, there is a silver lining. I cannot speak for all private music education as the quality varies highly. However, specifically for our guitar programs for kids. We have proven methods that can take a complete beginner guitar player to performance level on the guitar in the easiest and most fun way. The parents and the child can come and meet the guitar teacher to ensure they are the right fit for each other before starting lessons with us. The longer lesson duration means your child gets more feedback and experience playing under supervision. We also provide music education that benefits them beyond simply music. Children who come to our school benefit from improving their overall confidence. Learn new social skills and improved communication. The students also get a lot of say in the type of music they get to enjoy and play. So they feel more enthusiastic about learning. All children who come to the school are there because they have parents is supportive of their learning, and the child also wants to be there. They are enthusiastic and want to learn to play the guitar. As a result, your child benefits from the motivation of their surrounding peers to learn to play the guitar. The guitar lessons teaching uses proven tested methods to get your child the maximum result in the shortest space of time with the most fun possible. If your child wants to play the guitar more seriously, we have the ability and resources to progress them. They are in a safe and encouraging environment that is engaging. We pride ourselves on our students and their ability to be creative with their musical instrument, so they feel like real musicians rather than just copycat robots. We are a guitar school that specialises in teaching guitar so you can trust that your child is getting the best education for that instrument here both in the short term and long term too. I hope with this article has provided you with an insight into the benefits of private musical education rather than relying on the local school’s musical education as the only source of musical education for your child. If you would like more free information because you value your child’s musical education on guitar and care about the quality of their guitar lessons and the long-term benefits they can get from them. Then click on the button below to sign up for a free introductory lesson. 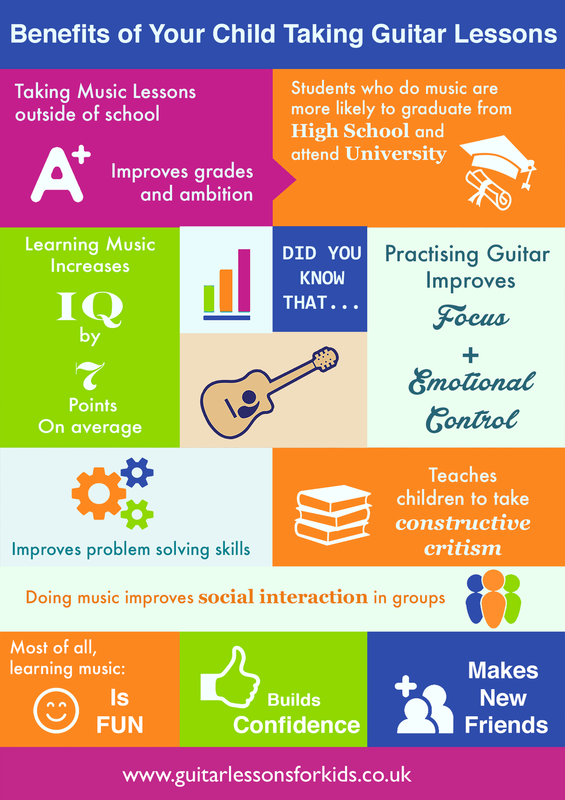 There are lots of benefits for your child when they learn a musical instrument, including guitar. Playing the guitar can benefit your child from a variety of standpoint including: academics, intelligence and social interactions. These benefits also carry on into adulthood. · Rhythm skills and pre-reading abilities are linked in the development of toddlers. · A 2013 study published in The Journal of Neuroscience found that for children and adolescents, even very basic rhythm abilities, such as tapping to the beat, relate with reading skills. · According to Dr. Nina Kraus’s work with the Harmony Projects, students who are in music are not only more likely to graduate high school, but also to attend college and university as well. · According to a German Institute for Economic Research study, teens who take music lessons outside of school score significantly higher in terms of cognitive skills, have better grades and are more conscientious and ambitious than their peers. · A 2014 Harris Poll found that music education lays the foundation for individual excellence in group settings, creative problem solving, and flexibility in work situations. · Taking music lessons offer a space where kids learn how to accept and give constructive criticism, according to research published in The Wall Street Journal in 2014. As a parent, it’s important to provide your child the right environment with other engaged children. This improves their social skills and have them enjoy their lessons. The more interaction and fun they have, the more likely they are to practise playing the guitar. Then they will enjoy playing for years and get tonnes of benefits that comes with playing the guitar! Click the button below to find out more about how we can help your child learn the guitar by applying for your free assessment lesson. This will take you through to our contact form so we can find out how best we can help you and your child with regards to guitar lessons. We are in Stratford, East London. Which is near Hackney, Leyton, Leytonstone, Bow, Mile End, Bethnal Green, Wanstead, Snaresbrook, Redbridge, Woodford. How Can I Get My Child to Do More Guitar Practise? During your child’s guitar playing journey, there may be periods when they are less enthusiastic about practising. This happens to every child, even the most well behaved. It’s not always because they aren’t enjoying the instrument, but rather there will always be challenges on the guitar that needs to be overcome when learning new pieces or new techniques. Learning to work through these challenges is what teaches children to take constructive feedback, and build patience and confidence. It helps them recognise that the hard work they put into practising actually improves their playing, which is immensely rewarding. In these harder periods of learning, it’s important as parents to continue to support them and help them get through these times so they can continue to get the rewards that come with playing the guitar. First of all, we should make sure that your child is enjoying their lessons with their guitar teacher. They should be in a fun, relaxed environment. They should be challenged and encouraged to try new things. They might go through periods where they aren’t enjoying themselves as much, but overall, they should look forward to the lessons. You should also have confidence that the teacher is providing the right materials for the children in lessons and also for their practice at home as well. One way to kick start their motivation and get them into practice as a routine is to do a practise challenge. Set a period of days and a certain amount of time they must practise daily to meet that goal. This should be something the teacher recommends. Then set a reward for the end of the challenge, something fun that they would enjoy like spending time with their parents on a day out or some chocolates. This helps to make practising a bit more fun and competitive with themselves to help encourage them. Just like brushing their teeth isn’t an option. Get them thinking practising is just another part of their daily routine that they have to do to get good at the guitar and get to go to lessons. It is so much more worthwhile for your child to do 10 minutes a day than 60 minutes at the end of the week. Just them just doing short amounts into their daily routine so they know it’s expected and when they progress through their daily practice, they will slowly feel more motivated to practice. With your smartphone or webcam, record their progress once a month. This gives a great record of how much they progress over time. When they have these guitar practising hurdles, both of you have something to look back on to see how much improvements have been made. This can be really motivating to see how much progress is made long term. Especially when practising can seem difficult always, it’s actually because your child is being challenged, and improvements are happening with their guitar playing. It’s important for the parent to know to a certain level what practice is and what your child should be working on when they are at home. Especially for younger children. Otherwise, you might get situations where they play around on the guitar and tell you they have practised when they haven't really practised. It is certainly okay to have some playing guitar time that isn’t practising, but real practice is where progress is made. It’s like the studying for an exam, where real learning is done. Whereas just doing the same exam over and over again just helps you memorise that exam paper. Practising is where new techniques are learnt, solidified and refined. If you know what they should do, then you can help keep them accountable at home. And when that happens, they can enjoy having you more involved in their guitar life. Also when they make more progress because they have practised properly, they will feel more motivated to practice. Do you see a pattern emerging? When you have friends or families visiting, say to your child that they would love to hear what they have been practising or playing. If you can give them notice, that’s great. As this happens more often, they will know to always be prepared, in case they need to play. It will help boost their confidence playing in front of others as well. Ensure you give them lots of praise for doing it. In the beginning, they may a little shy, but this will decrease over time. Doing this in your own home initially is a great way of easing them into performing or playing in front of others. After this, they can also get involved school assemblies or school plays etc. to help them. All of this will help encourage them to do extra practice. We hope these tips help you and your child to improve their playing on the guitar by doing more guitar practice. If you are wanting your child to really improve their playing while having a lot of fun in a relaxing, encouraging environment. And you are based in East London, then we would love to hear from you. Contact us by clicking the button below. We offer a free lesson so you can be confident that we can help your child progress on guitar. Choosing a guitar for your child may seem like a daunting task. At this early stage, it is important that you get something that is right for them and will help your child develop their love of playing the guitar. This article is written for you if your child is under ten, and they are interested in learning the guitar. How do you decide which guitar is right for them? When choosing a guitar for your child, the limiting factor is actually not the age of your child but their height. Watch our video with Guitar Teacher Darryl for the full illustration of how to measure up a guitar for your child. For your child, the first thing required if you need to sit them down and try out the guitars we are looking at today. If you live in London and you are looking for guitar lessons, come to speak to us directly and we will help you pick the perfect guitar. If you are not based in London, you can still use this information when you go to a guitar store to find a guitar for your child. We would recommend going into a store with your child so you can see what fits them best. The second guitar I would also check the size of is a full size electric guitar. It may seem odd considering a full size electric guitar for a child. As we will explain below, there are benefits to getting a full size electric guitar and specific reasons why a child can play a full size compared to an acoustic guitar. With both those guitar, you want to check if the child can reach along the neck and also if they can stretch over the guitar to strum the strings of the guitar. The 3/4 size classical guitar will fit most kids from age 6 and above. Very very rarely do I ever see a child needing a half size or even a quarter size guitar. 1) The guitar can last a lot longer, even into their adulthood, so you don’t have to worry about them growing out of their guitar. For an electric guitar, they come in various shape and sizes but generally they have a very thin body as you can see the image of Darryl, our guitar teacher with his electric guitar. This means your child can reach around easier to strum. The neck of the guitar is slightly longer than the ¾ classical guitar, but you may find your child can reach. There are plenty of videos with six-year-old kids playing full size electric guitars. This does not apply to full size acoustic guitars because they have a very large body, which makes them difficult to strum with shorter arms. If you find the electric guitar to be more expensive. It is a much better investment as they won’t grow out of it and can keep their guitar till adulthood. 2. If your child is above the age of 6, ask for a ¾ classical guitar and a full size electric guitar. 3. See if your child can comfortable reach the top of the neck to play the frets and be able to strum all the strings comfortably at the same time. 4. If they can reach the full neck on the full size electric guitar, this is more likely to be a better investment for you. Otherwise, the ¾ classical guitar will also work. If your child is still struggling, then a half size guitar may suit them better. I hope this article has been helpful to you. If you are based in London and you are looking for guitar lessons for your child that will help them develop confidence, learn to understand music, build a skill for life, then come contact us, we will be more than happy to help you pick the right guitar for your child. We have extensive experience in teaching kids and helping them become amazing guitar players, surpassing many adults who have been playing for more 20 years. We are so confident that we offer a free introductory lesson, so you can see what we offer here and ensure your child is ready to take the next step into the world of guitar. Please click on the button below which will take you through to our contact form for you to contact us further. Having a guitar teacher will help your child progress on the guitar. Having a GREAT guitar teacher will do so much more than just helping them progress. Let’s look at some of the key elements of a guitar teacher to ensure you pick the best guitar teacher for your child so that they maintain their love of guitar and grow their passion into something they keep for a lifetime. What are you really looking for in guitar lessons for your child? What are the most important things about guitar lessons for your child? Is it for them to enjoy playing the guitar? To progress quickly? To improve their confidence? To get them away from video games? These are the common things we’ve heard from parents. It’s important that you find a guitar teacher who understands how great guitar lessons can be for a child, and teach them the relevant skills to go forward in an engaging fashion. Rather than “just” providing standard guitar lessons. We know they can be so much more than that. How much are the lessons from this guitar teacher? This is a question that does get asked. Like everything else, you do get what you pay for, and it’s the same in guitar lessons. Often guitar lessons that are cheaper do not provide the same amount of results as more expensive lessons. Where they have more experience teaching. More experience in helping students get to an advanced stage. If one teacher takes 5 years to get your child to a level, and another takes 1 year, you would actually be saving money with a more expensive teacher who only takes 1 year. We know because we’ve seen students come to us having spent years learning with other teachers only to have the same result as students who have been with us for a short while. Or even worse, you get a cheap guitar teacher who gets your child to end up hating their instrument. And yes, we’ve seen that too. So it’s vital that you get the right guitar teacher. Where are the guitar lessons? A few parents have different thoughts on this. I’ve had parents who do not want someone in their home teaching their child, and those that are really keen to get a teacher to go to their place. For us, we know that we have the best facilities and studio that can provide everything needed to ensure a child has a great place to focus, and learn and also to have fun. When guitar teachers go to the child’s home, the parents are wondering if the teacher wants a cup of tea. The child is distracted thinking about homework or the iPad or computer game in the other room. Having the separation of your child from your home means they know this is the time to pay attention and learn guitar. Where they can focus and enjoy themselves as well. We’ve found that students get much more value for money when they are in a separate location instead of their own homes. Is the guitar teacher teaching them important principles? Different guitar teachers have fundamentally different principles on teaching, on how to play guitar and about learning. It’s important that you find a guitar teacher that has a great philosophy about teaching. A guitar teacher understands the importance of effort in producing results. They can help a child have a long term vision and produce more results in a child than just guitar progress. Because music is about so much more than that. Can this guitar teacher help your child progress all the way to an advanced level? One of the ways to see if a guitar teacher is right for your child is to see if they can show results of other students that they have helped reach a substantial level and also the experience they have had with the guitar teacher. Whether it’s testimonials online or perhaps in person, meeting some of the other students and their parents to find out what their experiences have been like. It’s all useful information to gather. Remember, glossy images of children playing the guitar does not mean the teachers can teach. You want genuine results to see. What is their experience as a guitar teacher and teaching children? Teaching children is different to teaching adults. On top of that, being a good guitar player doesn’t always translate into them being a good guitar teacher. So you want someone who is not teaching your child as a guinea pig but has the knowledge and skill to teach children. And also the ability to help them as they get older and improve their guitar playing. Having a trained teacher will help your child to have a lot more fun, rather than having experimental guitar lessons and progress a lot more as well. We hope you find the right guitar teacher for your child and if you were having doubts with your child’s current guitar teacher. We hope this guide has helped you regarding a few of the things to look for. If you and your child are based in East London and your child has shown enthusiasm for learning guitar then we would love to hear from you. Contact us at the button below to find out more. The guitar is perceived as a cool instrument and is coming up in popularity for children to learn. The guitar is now the second most popular instrument for kids to learn. The reason why so many children want to learn to play the guitar is because its presence in the type of music they listen to. The guitar is played by many pop stars and because so many adults play it too. Many children have been exposed to family members that have inspired them to want to learn. If you want to know whether the guitar is the right instrument for your child to learn, here are a few reasons why it might just be perfect for them. If your child has actively been asking you for lessons because they want to play the guitar, then that’s a great start! Maybe they have been inspired to play by a friend at school. Or they have a relative. Or they’ve seen someone on TV. Whatever the reason. If there is something that has sparked their interest. It’s much easier to encourage them to sit down to play and practise. If they really want guitar lessons, then it’s much better to let them play the guitar than another instrument. If your child is below the age of seven. The guitar may be a little too difficult for them. If they really want to play. Keep up the interest by playing them a baby guitar to play with at home. You can then see if they are definitely interested enough to carry on learning. Often when children get to around seven or eight, their attention span and dexterity improves a lot. Which means they can make a lot more progress in a short space of time. Some children can definitely start younger, but it may require a lot of attention from yourself to sit down with them to help them at home. When they are a little older, they can be more independent with their practising at home as well. Even though they are starting guitar a little later in comparison to other instruments, they are still young enough that if they want to take it seriously. It’s plenty of time for them to get really good as long as they put in the hard work and effort. Do you live in a small apartment or travel a lot? The guitar is a nice instrument to learn because it’s relatively small. Depending on how old your child is, they may have a different size guitar. But even if your child is a teenager, and they are on an adult size guitar. You can get travel size if you travel a lot. If you have a small apartment, you can easily fit a guitar in your house. Also, because it’s such a popular instrument. You will probably find a guitar in a lot of your friends and relatives houses that your child can pick up and play too. Does your child enjoy the sort of music guitar can play? The great thing about the guitar is that you can play so many genres of music with it. If your child enjoys pop, rock, any kids tunes, acoustic songs, then I’m sure they would love the guitar. Some children enjoy classical music as well. Which the guitar can be great for. Do they have time to learn? One thing to make sure if your child definitely has time to learn to play the guitar. If they have a hundred other hobbies already. Then it may be hard for them to keep up with practising, which can result in them getting frustrated with the instrument if they don’t make much progress. Daily focused daily practice is essential to helping your child learn guitar quickly and easily. This can be difficult if they have lots of other commitments. So before committing them to another hobby. Make sure they have time to go to lessons and also practise at home as well. I hope this article has helped you to consider a few reasons why guitar would be the right instrument and something that you should have your child learn. Every child is different, so it’s best to let them explore. If they have shown an interest. Find a guitar teacher would is able to help them have fun and enjoy their lessons. Helping them to learn their favourite songs and help build their confidence with the instrument.